Endogenous dormancy is considered to be inside the seed; associated with the seed embryo and/or endosperm (table 1). Table 1. A proposed classification system for endogenous seed dormancy types (modified from Nikolaeva, 1977). Physiological (PD) Physiological inhibiting mechanisms (PIM) of the embryo that can differ in depth. Morphological (MD) Mature seed contains under-developed or undifferentiated embryo. Combined (MD + PD) PD coupled with an under-developed embryo. Figure 1. Cenarrhenes nitida (Proteaceae) seedlings at the TSCC. This species shows a clear requirement for cold stratification to alleviate physiological dormancy. For more details click on image. but it was recently proposed that non-deep PD be further classified into five types based on patterns of change in physiological response to temperature during dormancy relief (table 2)2. There are also examples of Tasmanian / Australian seeds that exhibit physiological dormancy. Table 2. A three tier hierarchical classification system (modified from Baskin and Baskin, 2004). Seed scientists are sometimes criticised for failing to classify the type of dormancy their seeds possess when publishing experimental results3, but this may be due to the fact that classification systems are so complex, especially for physiological dormancy. Figure 2. 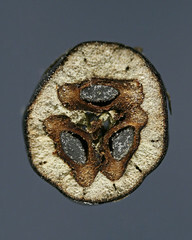 Cross section of a Stilbocarpa polaris (Apiaceae) fruit revealing three seeds. This species is proving to be very difficult to germinate at the TSCC, possibly due to MPD which has been documented for other Apiaceae species. For examples see refs 4,5 & 6. Some plant species disperse seeds in which the embryo is undeveloped or not fully grown. In these cases, the embryo needs to grow inside the seed before the seed can begin to germinate. 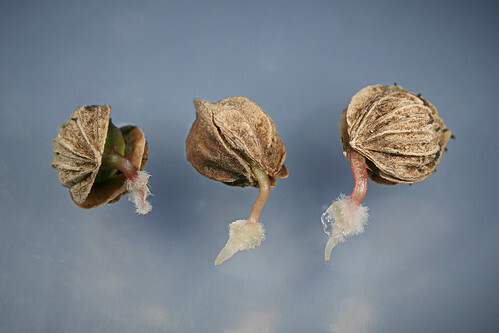 These seeds, although mature, are prevented from germinating by morphological characteristics of the embryo, and are therefore said to have morphological dormancy (MD, table 1). Morphological dormancy (MD) is often found in combination with physiological dormancy (PD), otherwise known as morpho-physiological dormancy or combined dormancy; MD + PD or MPD (table 1 and fig. 2). Nikolaeva MG. 1977. Factors controlling the seed dormancy pattern. In: The physiology and biochemistry of seed dormancy and germination. Khan AA, ed. New York, North-Holland Publishing Company: 51-74. & 3. Baskin JM and Baskin CC. 2004. A classification system for seed dormancy. Seed Science Research 14: 1-16. Baskin JM and Baskin CC. 1991. Nondeep Complex Morphophysiological Dormancy in Seeds of Osmorhiza claytonii (Apiaceae). American Journal of Botany, Vol. 78, No. 4: 588-593. Vandelook F, Bolle N and Van Assche JA. 2007. Seed Dormancy and Germination of the European Chaerophyllum temulum (Apiaceae), a Member of a Trans-Atlantic Genus. Annals of Botany. 100(2): 233-239. Vandelook F, Bolle N and Van Assche JA. 2008. Seasonal dormancy cycles in the biennial Torilis japonica ( Apiaceae), a species with morphophysiological dormancy. Seed Science Research. 18: 161-171.